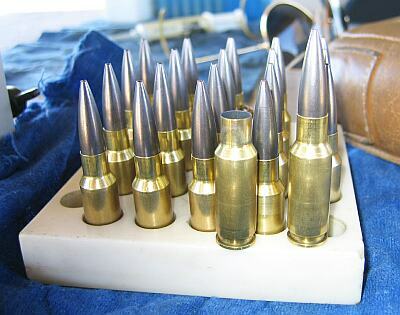 Start with a fairly large lot of Lapua 6mm BR brass; 500 pcs is nice if you can handle that much. Sort the brass by weight and then group in 50+ pc batches with as little weight variation as practical. After the weight sort is completed, put the batches in zip-locks or something to keep them segregated, and mark the weight and variation of each batch on the container. I like to prep 150 cases for each rifle, since one of the best things about the 30BR is its "no-brainer" tuning, so you can go to matches pre-loaded. I've done this from the start and it works great. Just find the load you're most comfortable with and go with it. Don't look back, and don't pay any attention to all the "experts" that try to tell you that the load has to be "tuned" for different conditions, like the 6PPC. The 30BR is a simple, practical workhorse chambering compared to anything I've ever shot previously, and I NEVER change the load. Next, set up your expanding mandrel and neck the 6BR brass up to 30 cal. The best commercial tool I have found for this job is the K&M Expandiron. Order the tool directly from K&M, and tell Ken you want the special mandrel for necking up from 6mm to 30 cal in one step. Lube each case neck lightly with your favorite concoction (engine assembly lube, Don "Pumpkin" Neilson's mixture, Imperial sizing die wax - they all work fine), then neck each one up with two passes over the mandrel. The first things you will notice about your necked up brass is a hefty "donut" on the outside at the junction of neck & shoulder, and that the previously 1.560 case length has shrunken to 1.520. Don't worry because this is normal, and the doughnut will be removed in the next step. Now set up a turner to uniform all the necks, or pre-turn if you prefer to call it that. For the brass I've prepped, that would be around a .012" thick neck for this step. Now turn all your necks to this dimension, cutting lightly into the shoulder and removing the donut at the same time. My next step is sort of an "ideal" prep step, but I think it is of some benefit. After the neck uniforming turn, I like to re-anneal the necks. I use one of Ken Light's turntable annealing machines, which is really fast and uniform, once you get it set up. Contact Ken at (800) 790-3184 or visit Kenlightmfg.com. Note that I found that MAPP gas torches were required to do this job, butane torches just wouldn't quite produce enough heat. Whether you re-anneal or not, the next step is to run all your cases back over the expander again. If you have chosen to do the re-anneal, you must thoroughly clean the inside of the case necks first. The oxides from re-annealing are very "sticky". You are now ready for your final turning operation. My recommendation for precise, consistent turning is Don Neilson's "Pumpkin" turner with the carbide mandrel. In my experience, the K&M expanders work nicely with the Pumpkin turner mandrels, but results may vary. You need to check your mandrel diameters to make sure that the expander is about .001" bigger than the turning mandrel. Once all this is properly set up, turn all your brass to the final dimension. I use a JGS "Ronnie Long" reamer which cuts a theoretical .330" neck. In practice, this reamer cuts a neck that measures .3304/.3306. You MUST measure your neck's ACTUAL diameter to know the ideal dimension for figuring what thickness you want your necks to be. You may be quite surprised what you find in this step. When Ronnie Long chambered my first 30BR barrel, the actual neck diameter came out at .3313, but when "Humble" Henry Rivers later chambered two spare barrels with the same reamer, the necks in those barrels came out at .3304/.3306. This is a significant difference when setting up a benchrest gun. All of these barrels shoot great, but the necks need to be turned to slightly different dimensions for an ideal fit. Once the neck turning is completed, uniform the flash holes, trim all the brass to a uniform length, bevel the inside with a Lyman VLD tool, deburr the outside of the case mouth, then polish the case mouth and neck OD with 000 steel wool. My last step is to uniform the primer pockets with a carbide tool that is made for Lapua brass, from Russ Haydon's (Whitetail tool?). After all the metal removal steps are completed, I wash all the cases in lacquer thinner or Shooters Choice Quik Scrub to remove metal filings and lube. A little on trim length, also. I have found that the reamer prints err considerably on the OAL dimension, usually to the "safe" side. You should allow approx .015" min clearance from case mouth to the end of the chamber. You must measure your actual chamber length to determine this dimension accurately. Sinclair's sells a simple little tool for doing this. It is a little plug that goes into a piece of trimmed back brass (note that you will have to trim the plug's OD for your tight-neck BR chamber). You just put the case with the plug installed into the rifle and close the bolt on it, thus forcing the plug to bottom in the chamber then be pushed into the case. The plug/case assy is then extracted from the rifle and the OAL is measured. Reset the tool with an inertia bullet puller, and do this procedure over a couple of times to make sure you get a consistent reading. Now you know the actual OAL of the chamber in your particular rifle, and can accurately figure the case trim-to dimension. One final thought--Henry and several others get good results turning necks in one step using the Pumpkin turner, without re-annealing. To each his own. However, I will say that, using my more complex procedure, I've never had to replace the brass for any of my 30BRs, even the one with over 7400 rds through it. Yes, I'm still using the original brass. Photo courtesy Randy Robinett, Bib Bullets.